Presented at the 4th International Symposium on Immunological and Clinical Problems of Food Allergy. Milan, Italy: November 5-9, 1989. Published in the Proceedings. The objective of this study was to investigate various pathogenic mechanisms that might operate when the whole blood of 9 food sensitive asthmatic patients was incubated with each extracts. Immunoglobulin levels (IgA, IgM, IgG, IgG4) in serum were measured using the turbidimetric technique employing rabbit antisera, to establish baseline levels. Whole blood from the same patients was then incubated, with each of the respective food antigens at 36.6 degrees C for 60 min. and serum was once again separated. A second turbidimetric analysis of Ig levels was made to determine if polyclonal antibody was bound to or released from cells. Activation of C3 or C4 was determined by rocket immunoelectrophoresis. 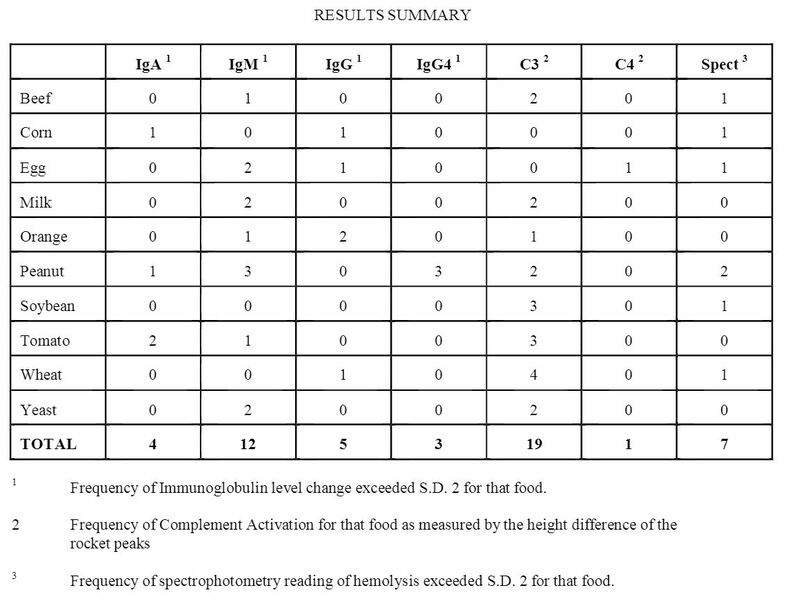 Amount of hemolysis released from lysed erythrocytes was measured by spectrophotometry. Results were analyzed by calculating percent change from control values in each of the 90 tests per pathogenic mechanism. Scores falling outside the range of #2 standard deviations were: IgA = 4, IgM= 12, IgG = 5, IgG4 = 3. Marked hemolysis occurred in 7 tests and complement activation was seen in 19 for C3 and in 3 for C4. Significant changes in one or more immunoglobulin and complement component occurred in every patient to one or more foods. In most subjects, multiple mechanisms associated with different foods were observed, suggesting that adverse reactions to foods commonly involve various triggers and pathogenic pathways.